We’d love your help. Let us know what’s wrong with this preview of Searching for the Heart of Sacred Space by Dennis Alan Winters. To ask other readers questions about Searching for the Heart of Sacred Space, please sign up. This book by landscape architect and Buddhist practitioner Dennis Winters is both a travelogue of sacred places and a scholarly study of why they are. The book focuses on two locales: the karesansui gardens of Kyoto Zen monasteries, and Mount Kailas and its associated sacred places in Tibet. On one hand, the book’s evocative descriptions of people and places share an affinity with travel books by Bruce Chatwin and Paul Theroux, and the spiritual journals of Peter Matthiessen. On the other, it is This book by landscape architect and Buddhist practitioner Dennis Winters is both a travelogue of sacred places and a scholarly study of why they are. The book focuses on two locales: the karesansui gardens of Kyoto Zen monasteries, and Mount Kailas and its associated sacred places in Tibet. On one hand, the book’s evocative descriptions of people and places share an affinity with travel books by Bruce Chatwin and Paul Theroux, and the spiritual journals of Peter Matthiessen. On the other, it is a scholarly study where the author applies his mature spiritual practice and knowledge of Buddhist scriptures to decipher natural and built landscapes. And lastly, it reads at times like a heroic quest, with clues presented by the places the author visits, the people he meets, and the texts he seeks to understand. The reader is invited along the way to search for Tibetan sources for Japanese garden designs using the device of a quest for 8,631 upright stones described in a Japanese garden design text. All of which is in service of exploring the author’s main and recurrent questions and investigations: do harmonious and sacred landscapes have the capacity to aid in spiritual development?, and to what degree does one need to be spiritually developed to design sacred landscapes? That said, the book is not about design per se, but the impetus to render the world more legible and meaningful that drives our creative pursuits and passions. 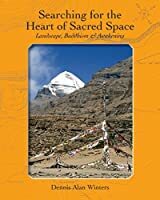 The book is most compelling and convincing when the landscapes of western Tibet are both spiritually and scientifically described. Here the author’s conversational voice effectively links outer journeys with his inner work – western knowledge with esoteric wisdom. Indeed one of the strengths of the book is its episodic nature, with the reader regularly introduced to new themes, places, and observations. But, this is also a weakness. I wished at times to more deeply understand the connections the author was seeking between often-disparate subjects and his overall thesis. But, one of the book’s virtues is that it doesn’t offer easy answers or personal reconciliations to the author’s primary position: that the “truth of design” is only approached through sincere and serious inner inquiry, but is also accessed by the experience and making of sacred places. As such, the book will appeal to designers who seek to create more spiritually embodied places, laymen interested in more deeply understanding the built and natural environment, and readers who simply enjoy a well told story of a seeker’s journeys.